The dozen peppercorns in this set exhibit an incredible range of spice and character. Known as the Spice of Kings, the peppercorn has reigned over the table for centuries. Influencing trade with Rome, Ancient Egypt, India, and China, this powerful little spice was once so valued so highly it was used as a form of currency. Apicius, the Roman author of the first cookbook, recommended adding pepper to enliven the flavor of dull boiled foods, and also to enhance the flavor of some sweet dishes. Like the countries from which they hail, the dozen peppercorns in this set exhibit an incredible range of spice and character. Expand your palate by grinding these assorted peppercorns on your go-to dishes, or complement a specific cuisine with a dash of pepper from the same locale. Peppercorns from India, Brazil, Malaysia, Europe, France and USA. Packaged in the USA. 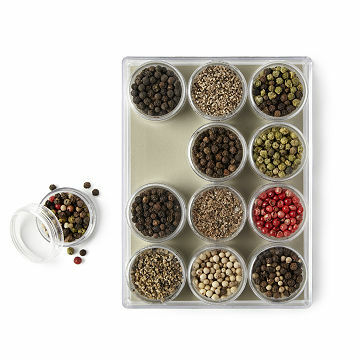 Check out our Gift Lab to see a member of our team use our Global Peppercorn Sampler to make peppery pickles! In 2008, Linda Szymanski ran out of the gray French mineral sea salt she had used for years. Searching for more, she discovered an entire world of colorful and exotic sea salts and decided that everyone would enjoy exploring this delicious world of sea salts, too. Of course, it wasn't long before she discovered peppercorns and with some more research, she discovered an amazing variety of this “Spice of Kings” and soon found herself surrounded by an array of spices. Keep at room temperature; avoid extreme heat or cold. Please note that the peppercorn country of origin selection within this set will vary. Great for seasoned chefs and new cooks alike! Gift for my dad to spice up his weeknight cooking recipes. The product itself is great, I got it as a gift for my stepdad who cooks a ton. It has a large variety of peppercorns. Was a gift, they loved it. It was a gift so I do not use it. Great selection of gourmet peppercorns sure to delight everyone from novice cooks to expert chefs! Love the descriptions and flavor profiles about each! My wife's a gourmet cook! Last year I got her the International salt collection in the wooden case, this year the peppercorn collection. She LOVES them both. Two years in a row I've hit a home run with Uncommon Goods! Thanks guys - can't wait to see what you come up with to save me next year! I got this for my husband as one of his Christmas presents. He absolutely loved it! So much so, that I am back getting him another one for Father's Day. Only drawback, for him, is that he uses a LOT of pepper, so the small containers didn't last very long. Great gift!